Despite major efforts to keep operating rooms sterile, surgical wound infections remain a serious and stubborn problem, killing up to 8,200 patients a year in the U.S. A study by Columbia University Medical Center (CUMC) researchers suggests that narrow-spectrum ultraviolet (UV) light could dramatically reduce such infections without damaging human tissue. The study, conducted in tissue culture, was published today in the journal PLOS ONE. Approximately 200,000 to 300,000 patients suffer surgical wound infections in the U.S. each year, accounting for $3 billion to $10 billion in health-care expenditures, the researchers report. Patients with surgical wound infections, compared with those without such infections, are 60 percent more likely to spend time in an ICU, are five times as likely to be readmitted to the hospital, have twice the mortality rate, have longer hospital stays, and have roughly double the total health-care costs. Scientists have known for many years that UV light from a standard germicidal lamp (which emits a broad spectrum of wavelengths, from about 200 to 400 nanometers [nm]) is highly effective at killing bacteria; such lamps are routinely used to decontaminate surgical equipment. 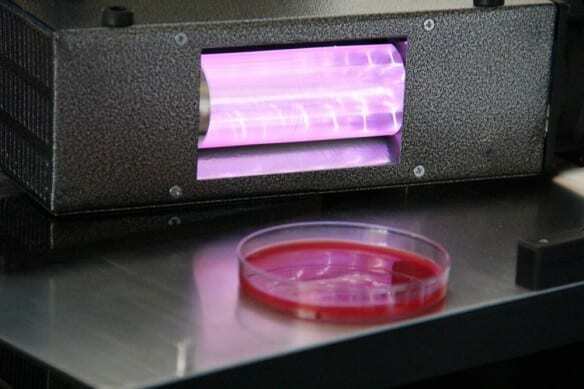 To test this hypothesis, Dr. Brenner and his colleagues exposed MRSA (methicillin-resistant S. aureus) bacteria, a common cause of surgical wound infections, and human skin cells to a krypton-bromine excimer lamp (also known as a KrBr excilamp), which emits UV light only at 207 nm, as well as to a standard germicidal UV lamp. The researchers found that 207-nm UV light was as effective at killing MRSA bacteria as a conventional UV lamp. However, the 207-nm light resulted in 1,000-fold less killing of human skin cells than did the standard UV light. April 11, 2019 - Implanting Pedicle Screws Without Bacteria Infection Control Todaysurgical site infections (SSI) occur at the higher end of 2 percent to 13 percen.